As we head through the Days of Awe, my thoughts turn to charity. Not so much charity as involved with writing a check, but charity as involved with volunteerism. I’ll admit it — this was sparked by a timely email from Angie Kitzman at the Jewish Federation of Fort Worth and Tarrant County. I’ve written about this organization in the past, pointing out that it’s responsible for supporting many Jewish educational programs in Tarrant County. And now, with the beginning of 5773, the Federation needs volunteers for its upcoming programs. One such program, “Gumbo in the Sukkah,” will take place Oct. 3, and some extra hands are needed that evening to help out. Other events at which you can volunteer include the Community Thank You Program (to take place on Nov. 17); the Scholar-in-Residence program (first meeting is Dec. 20) and the Purim Carnival, women’s event, Yom HaShoah, Yom HaZikaraon and Yom HaAtzmaut, all of which will take place in 2013. Lending your time and support takes so little time, but serves the greater Jewish community — so feel free to contact Angie at 817-569-0892 or email her at a.kitzman@tarrantfederation.org for details. In the meantime, please accept my belated wishes for a sweet and prosperous new year. 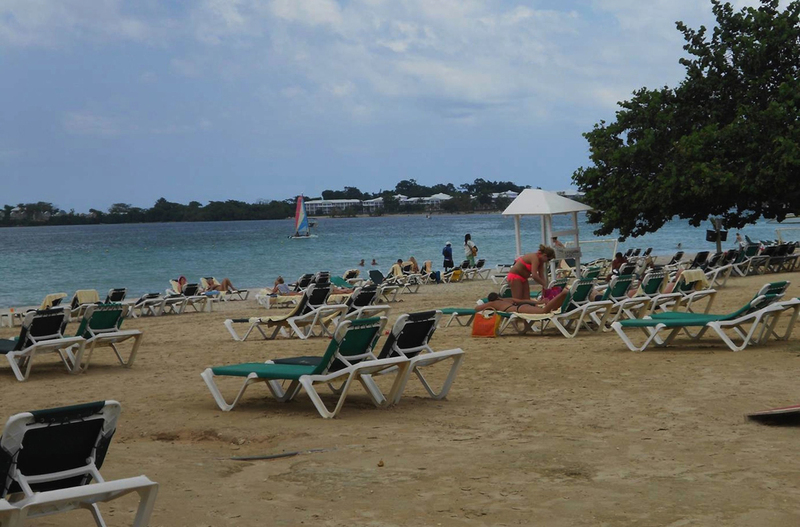 Robin Tirsun writes that she and husband Dan (members of Congregation Ahavath Sholom and Beth-El Congregation) recently returned from a visit to Jamaica. The couple’s travels included Riu Palace in Negril, Grand Palladium Lady Hamilton in Negril, the Gran Bahia in Runaway Bay and the Riu in Ocho Rios. “We loved the beaches in Negril and Ocho Rios. We stopped and had a drink at Rick’s Café to see the sunset and cliff divers,” Robin writes. But these trips represent more than fun and sun for Robin and Dan — they also get involved with the local Jewish community on their travels. This time, the couple didn’t travel to Kingston, due to some unrest there. But Robin shared some fun facts. For one thing, there are 200 Jews residing in Kingston, and the island also boasts the United Congregation of Israelites’ Shaare Shalom Synagogue and the Neveh Shalom Institute, founded to protect and purchase old Jewish remains from Colonial Jamaica. This is Dave Sorter, rudely cutting into Amy’s wonderful column for an announcement that concerns … well, Amy. My loving wife/your trusted correspondent was very involved in theater in the past, and the bug has hit her again. She won the role of Lt. Rooney in the Plaza Theater of Cleburne’s production of “Arsenic and Old Lace,” which is on stage at 7:30 p.m. Thursdays, Fridays and Saturdays, and 2 p.m. Saturdays, through Oct. 13. And after that, our son, Michael, will be in Plaza’s production of “Ragtime,” Oct. 19-Nov. 17. Looks like the Sorter family is getting into the theater groove … Now, back to Amy and her usual great stuff. OK, so now my face is red with embarrassment, but I’ll soldier on. The members of Alton Silver BBG, who were pictured in last week’s issue, sold concessions on Sept. 2 as part of B’nai B’rith’s annual summer movie event. Jim Stanton writes that this year’s event (featuring the movie “Mamma Mia”) was a huge success and set a new attendance record. Almost half of those who attended saw the movie indoors, while the remainder opted for the outdoor experience. Corrine Jacobson writes that she’s recovering from pacemaker surgery — we’re glad it was successful and that she continues to heal. Barry, whose editing skills have been used to develop features and bonuses for shows such as “Smallville” and “Nikita,” is the son of Steve and Cindy Bond (formerly of Carrollton and currently living in Atlanta). Also in Los Angeles is Barry’s sister, Lisa, who is an obstetrics nurse. Thanks for catching us up, Corrine. I mentioned this a couple of weeks ago, but reminders are always good. The September Daytimers event will take place at noon on Monday, Sept. 24 (rather than the usual Wednesday), at Beth-El Congregation, 4900 Briarhaven Road in Fort Worth. Featured guest is Cantor Bruce Ruben, director of the Debbie Friedman School of Sacred Music at Hebrew Union College. Ruben is on hand as Beth-El Congregation’s High Holy Days cantor as well. For the Daytimers, he’ll present the program “The Impact of Jewish Music on the American Musical Theater.” The event will also include a sing-along, and lunch will be catered by Pak-A-Pocket. Those interested in lunch can pay $9; if you don’t care to eat, the program is $4. Questions? Want to make reservations? Call Barbara Rubin, 817-927-2736 or Hugh Lamensdorf, 817-738-1428. You can also reserve online by logging onto www.bethelfw.org/donations. B’nai B’rith’s Person of the Year award dinner will take place on Sunday, Oct. 28. We don’t have the specific details just yet, but we known enough to let you folks know that authentic Russian food will be served, with Klezmer music as the entertainment. Sounds like a really great time — stay tuned for more information. In memory of Amrita Shlachter, who died of a brain tumor last December, Hollace Weiner has organized a team — “Amrita’s Army” — to participate in this year’s 5L Brain Tumor Walk, which is being sponsored by the National Brain Tumor Society. This walk will take place at 9 a.m. on Saturday, Sept. 29 at Trinity Park in Fort Worth. For more information, contact Hollace directly at hollaceava@gmail.com or log onto http://www.braintumorcommunity.org/. … which is just around the corner. Rabbi Andrew Bloom of Congregation Ahavath Sholom is hosting a holiday service at 6 p.m. Sunday, Sept. 30 in his sukkah, complete with light refreshments and desserts. The event begins at 4:30 p.m. If you’re interested, RSVP to CAS’ office at 817-731-4721 by Sept. 24. Also, according to the newsletter I receive from Congregation Beth Israel in Colleyville, while Rosh Hashanah and Yom Kippur are a time for reflection and repentance, Sukkot is the time to party. Not the “streamer-and-champagne” type of party, but the “rejoicing in the harvest and getting together with your community” type of party. As such, there is no lack of sukkahs or sukkah-building activities in Tarrant County. Jewish organizations will offer a variety of celebrations and building activities, so keep an eye out. Sukkot begins sundown Sept. 30, so check the calendar section of TJP to find a celebration and/or building activity that’s close to you. Don’t forget to send other Tarrant County info to me at awsorter@yahoo.com. By “information,” I mean celebrations, family reunions, vacations and so on. You get the picture.